Driven by career-high performances from Tony Curtis and Burt Lancaster, “Success” is distinguished less by story-telling than by its atmosphere. 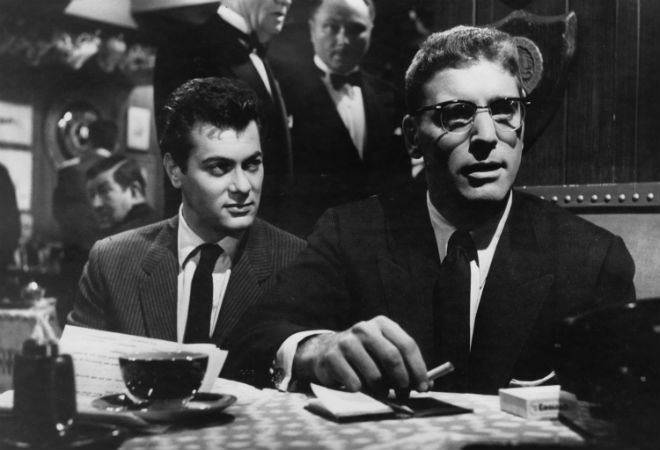 Directed by Scottish expat Alexander Mackendrick with a tabloid eye, like Tony Curtis’s agent on the make in Manhattan, Sweet Smell of Success has lurked in the shadows of movie history before slipping into its classic reputation when no one was looking. Driven by career-high performances from Curtis and Burt Lancaster as an all-powerful gossip columnist—everyone else struggles to share the screen with either of them—Success is distinguished less by its story-telling than by the atmosphere of clubs and curbsides, penthouses where professional character-assassins lust after their baby sisters, and men in rooms pimping out women to other men in other rooms, when they’re not destroying other men. We just want to soak in every sordid moment and listen to the toxic gab written by Ernest Lehman and Clifford Odets. “I would hate to take a bite out of you,” Lancaster snarls at Curtis, “you’re a cookie full of arsenic,” and even if there weren’t Elmer Bernstein’s jazzy score, the fabulous James Wong Howe cinematography, the seemingly endless night that swallows the film from dusk to daybreak, and the fact that the scenes of Lancaster’s apartment were filmed in pop music’s famed Brill Building, this would be the definitive New York City movie for that line alone.